Place the Oreos in a food processor and grind until finely crumbled and looking like dirt (include the cream). Cream together the butter and cream cheese. In another bowl whip the whipping cream and powdered sugar until thick. In a third bowl, combine vanilla pudding and milk. Mix well for two minutes. Stir the whipped cream into the pudding. Add the butter/cream cheese mixture and stir well. Layer the cake in your bucket 2-4 hours before serving time. (I did mine the night before, and it turned out fine.) Place 1 1/2 - 2 inches of cookie crumbs in the bottom of the bucket. Then layer the same amount of pudding mixture on top. Continue layering them, leaving room for a layer of crumbs on top. Just before serving, top with crumbs and worms. Serve with a shovel. Oh my gosh, it has been forever since I've had dirt cake. I have to admit I love it. I may have to challenge myself to figure out a way to make it somewhat from scratch. 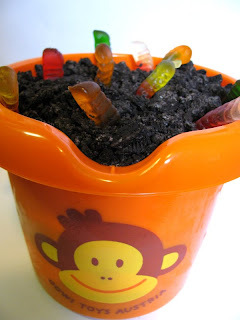 I remember the first time my grandma made me dirt cake. It was for a halloween party and she put a chocolate zombie and coffin on the top of the cake. It was so delicious and even though I thought it was a little creepy at the time, it seems really cute now. Absolutely adorable! I've seen this somewhere before, but yours is by far the cutest! Thanks for sharing the recipe of your cake ...I like it..Sounds interesting..
Hey really nice. Keep it up..!